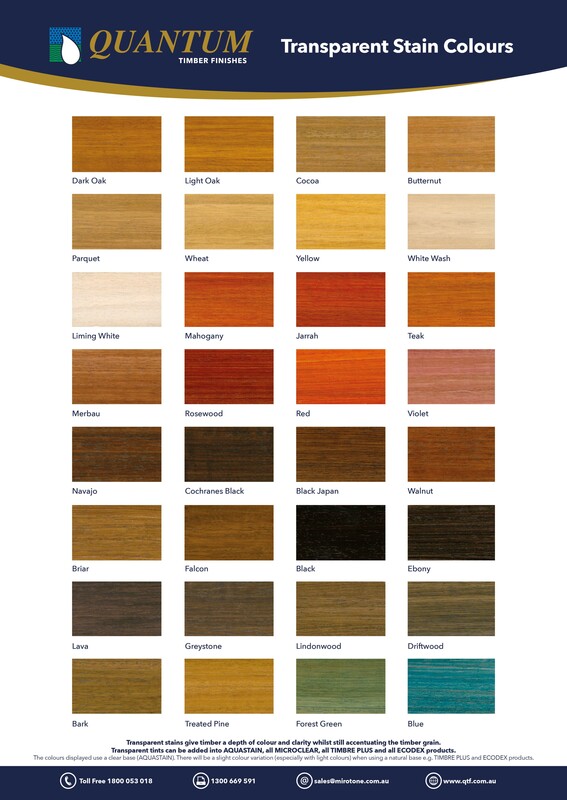 Quantum has the largest colour range available in the wood care market with the added ability to colour match. With the choice of 32 standard transparent stains and 40 standard opaque solid colours that do not conceal the grain of the wood, Quantum gives you the freedom to create the look you want for all your interior and exterior projects. When choosing a colour for your project it is important to consider the type of timber finish you require for your chosen project. The choice of timber stain or paint colour is crucial as the surface will need to withstand general wear and tear and environmental factors. It is also important to consider the type of timber used for the project. Final colour appearance may vary with different timber species, texture, size and shape of the area. Transparent stain finishes offer the timber a depth and clarity that cannot be derived from any other finish. Transparent tints (stain) can be added to clear finishes to provide colour whilst still allowing the grain to show through. Transparent finishes allow the underlying timber grain to be highlighted as part of the finished appearance. Transparent stains colours can be added into AQUASTAIN, all MICROCLEAR, all TIIMBRE PLUS and all ECODEX products. Opaque solid colours can be added to MICROCLEAR, AQUAOIL, ENVIROLOC and E.L. DECKCOAT. 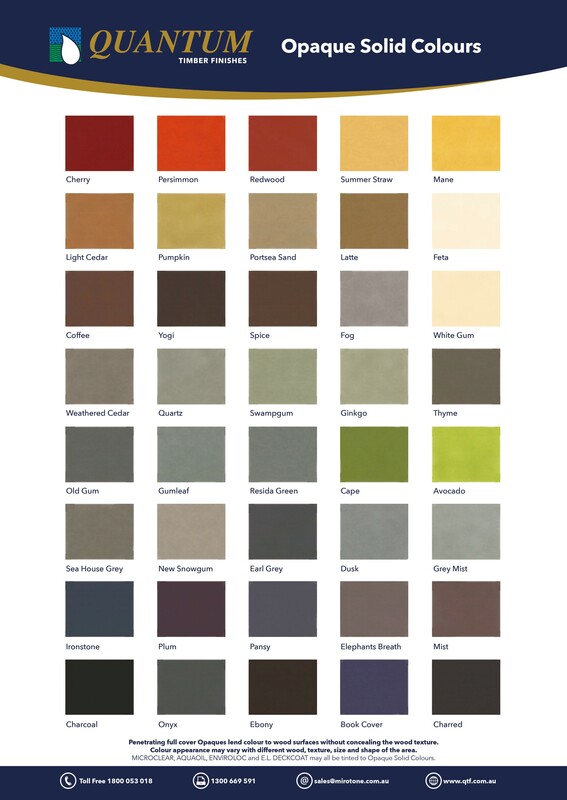 Our full timber stain colour and opaque colour charts can be viewedbelow. Need more information about our colour range? Contact Quantum. These colour charts are as close as possible to the actual colour, however viewing on a screen can greatly change the appearance of a colour. Please ensure you check the colour on a sample board or prepare a test sample before application.